Michael T. Leibig - distinguished attorney, defender of the rights of working men and women - stood in the well of the Supreme Court, nine black-robed justices gazing down upon him. Family members in guest seats three rows behind were nervous on his behalf. The atmosphere was intimidating. We knew that, although Mike continued to work the long hours of a Washington attorney, he was acutely ill with a rare leukemia that he carried longer than any known patient. Mike stood on feet that he could not feel. His well-pressed suit billowed from a frame that had shrunk beneath it. Furthermore, in his heart Mike knew that this court was unlikely to side with his clients. Yet none of these things weighted Mike's presence. None could be detected by a Justice. Mike had written that his father "stretched to five foot three" yet "he was a large person; he filled a room" (page 58). The son spoke like the father, "crisply, assured in the active voice," responding to some justices with wisdom, parrying some with humor. He made his case so engagingly that justices continued to parry with him beyond his allotted time. In the eyes of his burley, Police Union clients seated with us, Mike was a winner regardless of the final ruling. Mike Leibig, traveling in disguise. From time to time Mike would circulate a remembrance through the Leibig family into which I had married. They were funny stories: just as good - if you had an interest in Leibigs - as James Thurber's essays on his childhood family that were once my favorite reading. They also helped to make some sense of this vast, noisy clan into which I had stumbled by wooing the one daughter. Mike's story gave me, an only child with parents divorced, a glimpse of something I had not experienced - full-throated family. "Can such stories be true?" asks the literalist. Mike replies, "This report is absolutely accurate. ...Imagination is much stronger and more real than memory" (page 29). I also write family history. I have pasted on my computer a quote from Gao Xingjian in One Man's Bible. It is by cloaking naked reality with a gauze curtain, ordering language and weaving into it feelings and aesthetics that you are able to derive pleasure from looking back at it, and are interested in continuing to write. Something new emerges when these stories are assembled together - a portrait of Mike himself. He writes primarily about others, but as you read from story to story you begin to see the seer, to know the writer. Even if the stories themselves were not so enjoyable, this meeting would be worth the trip. In the final story, and again in the final poem, we meet the Mike who stands ahead of us on the brink of a precipice. This is a profound experience; you need the earlier stories to prepare yourself for it. At least in his dreams, Mike has found the courage to face disappointment and even death with self-emptying anticipation - trusting, only and completely, in "the angler of men" (page 110). Traveling in disguise, beyond sight. Mike stresses that these essays are about family: not just the Leibig family, but the importance of family in developing and sustaining the true self of each member. Readers who know no Leibig will find the stories rewarding. The one introductory detail that a new reader may need to know is that Mike's father, Eddie, had four children with his first wife, Anne Cummiskey, who died giving birth to their only daughter, Anne. After several years Eddie and Ellen Connolley married; they added four more sons, including Mike, to the large household. 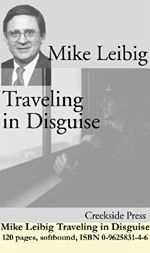 Mike's oldest brother Ned Leibig suggested this book project to my wife, Anne Leibig. Anne secured originals of the writings from Mike, scanned them into our computer and, with assistance from Joan Weingartner and myself, performed the minimum copy-editing that time permitted. They are not professional editors, and time was too short to allow Mike to review their work. Anne asks pardon for the typos and errors that remain. I designed the book and laid out the pages. David McFarlane of McGrafX undertook printing and binding. Creekside Press will distribute the book through CreeksidePress.com. As a recently retired theologian, I will put that hat ("disguise?") on again for my final word. Mike has discovered the truth that the Almighty, to administer this unruly world, must have a keen sense of justice, abundant supplies of mercy, and a sense of humor! How else could God continue to love this large, noisy, mischievous human family. Accepting that insight, I forecast that the moment will come, within eternity, when God summons before the Throne of Grace both Eddie and Mike together. "I want to hear that story, the one about Corning's twin town, from both of you!" My Father died seven years ago. We waited at the curb, six brothers and I, awkwardly, for the car. There were no trees in front of the sandstone based Church. I saw horse chestnuts in the gutter. The car arrived -all black. I saw a white roof. We carried in a shining wooden box. The load was light. Ned read Ecclesiastes from the altar. And when man eats and drinks, this is a gift... What does a man gain for the effort that he makes?... So it is that a man who labored wisely, skillfully and successfully must leave what is his own to someone who has not toiled for it. It was a morning Mass before a railed altar. I saw the wide front staircase at twenty-six East Third Street. It sloped up gently to a landing. The landing lay wooden-floored and empty - a separate, between-floor box used only to contain the Christmas tree. From January 2 through December 24 the landing remained vacant. At Christmas, eleven specifically assigned sections of shelving awaited the gifts of each Leibig for the others. And from the landing, turning back, a twin flight of stairs sloped higher again to the Second Floor. Ellen and Dad's room and Peter's nursery lead the House at the front of the Second Floor. From their rooms, the Second Floor Hall ran between a railed banister which looked out over the Landing and Grandma Leibig's room to the large room which followed after. Conk (Thomas Connolley, after Grandpa Connolley), Paul, sometimes Peter, and I were dormed there; each in his own territory with carefully surveyed, but often disputed, boundaries and rights-of-way to the door and closet. Paul and I held allied ground in the back of the room, one bed at each wall with a window between. Conk's bed straddled the center, jutting out from the wal1. At times of strife Paul and I tight-roped an easement line through to the door. We attempted to enforce a similar inhibition on Conk's access to the closet. In the front of the room, off to one side surrounded by window was Petie's area with a crib and playpen which were used when he was not sleeping up in the front room closer to Ellen and Dad. Anne's room was next to ours, separated by a large bathroom and a side door to Grandma's room. Ned, Bill, and John were in High School and thereby gained the Third Floor - an unexplored frontier reached only by a narrow, closed-in stairway through which you rose upon entering Corning's Free Academy. Anne told us one night over clandestinely made peanut butter fudge that there was a hidden, easier passage up to the Third Floor. It lay behind a heavy chest or in the back of a small closet. Ellen and Dad came home early that night and we hid the remains of the fudge in a rag closet part-way up the back steps off the kitchen. Later, Paul and I explored and mapped the House but our charts showed only spirits and dragons off the edges behind closets. It was early Saturday morning. Conky, Paul, and I, sat in the First Floor Front Room listening to "Big John and Sparky" on the radio. Conk was in charge of the round, orange-lit dial - of keeping the radio tuned-in. A Dan's Dairy Ad came on and he tried to tune-in Borneo. We always did that but never heard much, through the static, only a muffled "distress code" which we couldn't make out. We did pull in Montreal Canada, once. The program was French. As Conk, ear to the speaker, knelt working the dial, Dad came down the front stairway quickly. He was short. He even seemed so to me at eight. His "brush cut" white hair was also short. His scalp showed. His forearms were unusually large, freckled, and matted with soft hair. He wore a watch - a cow-hide covered metal clasp which stayed in place without a buckle. He walked directly and briskly and spoke in a matching way with a forceful crisp enthusiasm. He was at the last step before we could turn to hear. "Christopher Columbus! You guys waste'n time on Borneo again. Let's get the show on the road. We're all ready already old enough if not getting past it."